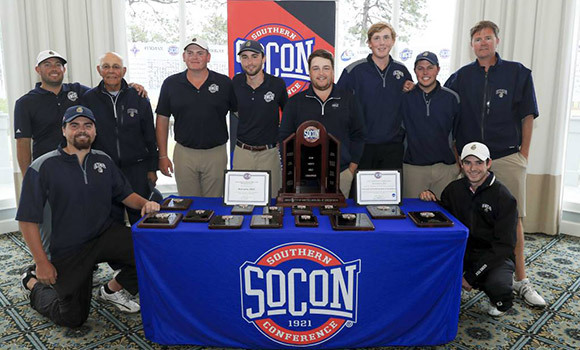 The men's golf team poses for a picture with the SoCon Championship trophy on Tuesday. The UNCG men’s golf team won its first-ever Southern Conference Championship by five strokes with a team-score of 18-over par 882 (297-285-300) in windy and rainy conditions on Tuesday at the par-72, 7,118-yard Pinehurst No. 9. Freshman Nick Lyerly became the second Spartan to win the SoCon Individual Championship, turning in a 4-under 212 (73-70-69) for the only sub-par score in the field. UNCG clinches the automatic bid for the NCAA Regionals May 14-16, in what will be the program’s second NCAA appearance after earning an at-large bid in 2013-14. The selection show for the regionals is May 2 at 5:30 p.m. on the Golf Channel. Terrance Stewart was named the SoCon Coach of the Year after guiding the Spartans to win the championship. Stewart is the first coach in program history to win the award from the conference.